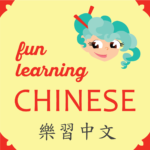 This 5 sentence guide to life is full of not only encouragement, but also a lot of useful Chinese vocabulary. Don’t worry, it will be translated below. Here is some specific vocabulary that may help to hear as distinct words in order to understand this better. The 5 sentences have some very “serious” vocabulary, but these words are common in Chinese sayings, so will come in handy. Also, the sentences all have the same basic grammatical structure, which should help with both understanding and remembering. And courage keeps you going. Here are two more easy philosophical sentences. ❶ There is a slight difference between 保有 and 保持. 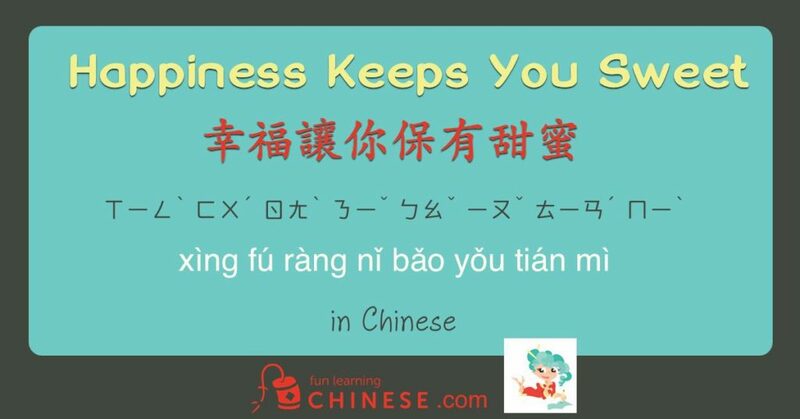 保有 is used when you are keeping something that you have within yourself, while 保持 is the choice if it is something that you have to work at. ❷ 甜蜜 is a fun word because it more literally means “sweet like honey.” This also reminds me of the words for bee and honey, which are the same two characters as each other, but in opposite order. One way to remember which character is which is that the character for bee has the radical for insect 虫 in it. This character choice seems to emphasize that while this may be an abstract and spiritual phenomena, it is something real and can be sensed. You can’t fake being human. If you aren’t, people will be able to tell. 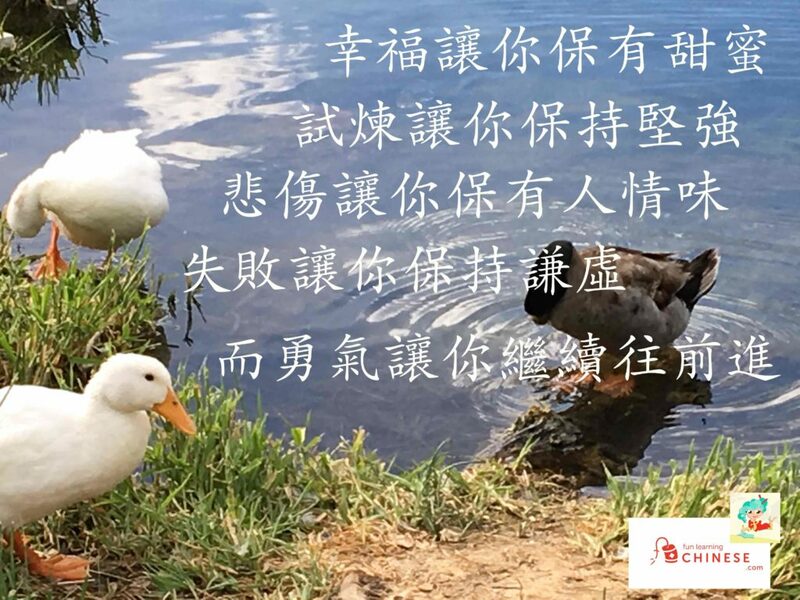 ❹ My Chinese tutor chose 謙虛 for humble because it indicates having the correct attitude of humility without thinking so poorly of yourself as to be in despair or be despised, as something like 謙卑 ㄑㄧㄢ ㄅㄟ (qiān bēi) might connote. All together they mean to keep on going or to move forward. ❻ The word for wealth indicates it could include money, but isn’t limited to it. The first character, 財, stands for anything considered to be of value. The second character, 富, means abundant or ample. So, to be wealthy is to have the things you value in abundance. ❼ 之 is equivalent to 的 here. It means that what comes before it describes what comes after it. In English, it could also be translated “Failure is success’s mother,” but that is more stilted and not as fun to say. ❾ If you read/listened when this was first published you would have seen this sentence like this: 失敗是成功之母, with 是 ㄕˋ (shì) instead of 為. Either word can be used, but we discovered on re-listening that my tutor had habitually said 為, so I changed the written part to match that.